The Farmers Walk Handles for Strongman Exercises develops Bodacious Forearms and a Vice-Like Grip While Building Functional Strength. The Farmers Walk is a Traditional Strongman Exercise requiring a Strong Back and Mammoth Grip Strength. In Strongman Competitions the Weight varies from 265 lbs to 400 lbs per handle. The Strongman Exercise is to walk or run a set distance at the fastest time. 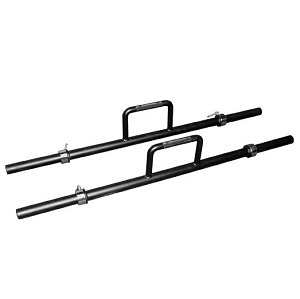 Farmers Walk Handles are also great for Shrugs and Deadlifts.